EXPLORE: Click on the "Bar Graph" link below. Then explore the items in the light gray bar at left! Click on the arrow next to the "+" sign. Try each option. Click on the arrow in front of "Bar Graph". Then click the Gear icon/"Done" to exit. What is its purpose? Click on the "<<" icon twice! What is its purpose? Add a 5th orange bar. Make the width 1.5 units and the height 8 units. Add an Orange image and position it above the orange bar. 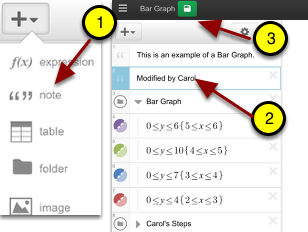 Add your steps inside the Bar Graph folder. Step 1: Add the orange bar. 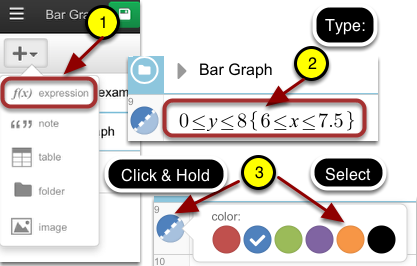 Click the "+arrow" button and select "f(x) expression". Type in the function. You may need to access the bottom left key board icon to select from a keyboard. Change color by clicking the BLUE circle. Hold 3 seconds for the color palette to show. Select the orange color. Step 2: Make the image that says "Orange". Select "Note" from the "+arrow" button. In the new note, type: "Orange". Capture the word using your computer's image capture. Select "Image" from the "+arrow" button. Browse to your image and upload. Shrink the image by dragging the bottom right handle diagonally up. Move the image by click/drag from the center. Step 3: Create an additional Folder and move your steps into it. Add folder. Name your folder. Drag the folder icon to any place in the list. Drag your steps just under each other to add to folder. Vertical lines will appear. Click the folder arrow to close. Step 4: Add a note. Type on your note: Modified by <your name>. Position the note by dragging the step up or down. Click the name of the graph. Find the graph under the 3 parallel bars!